Valero Texas Open golf tournament. 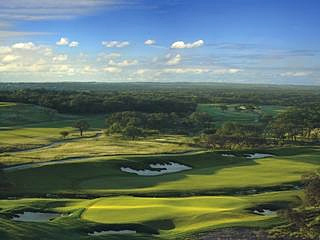 Click Here to the Slide Show of the La Cantera Resort Course home to the 2008 Valero Texas Open! Welcome to CaddyBytes.com’s Tournament's page for the 2014 Valero Texas Open golf tournament. The Texas Open is one of the oldest professional golf tournaments on the PGA Tour with it's inception in 1922. Brackenridge Park was where it began and was hosted for 17 years consecutively at Oak Hill CC to the La Cantera Resort Course in 1995. Beginning in 2010 the tournament was played at it's newest and now 'permanent' venue at the new TPC of San Antonio tournament golf course. The 'Texas Open' as it was traditionally called has moved to a new and more prominent spot in an official position on the PGA Tour and now is part of a Texas two step with this event and the Shell Houston Open next week which precedes the 2014 Masters tournament. There have been some notable and great past champions of the Texas Open including Walter Hagen, Byron Nelson, Ben Hogan, Arnold Palmer, Tom Watson, and Ben Crenshaw to name a select few. Brendan Steele won in 2011 with Ben Curtis in 2012 with Martin Laird winning last year in 2013 and defending here this week. -Stay Tuned For CaddyBytes.com for exclusive pictures, stories, interviews, and news the week of the Valero Texas Open! New in 2014 Golf and Travel is the place to go on CaddyBytes for golf courses travel to info places to stay and play!